The Short Version: Located in historic Jacksonville, Oregon, the Britt Music & Arts Festival features a naturally formed amphitheater set among majestic pines on the hillside estate of 19th-century photographer Peter Britt. This one-of-a-kind, organic setting is perfect for couples looking for a romantic locale to enjoy world-class music in an array of genres — from jazz to blues to folk to pop and country. Throughout the year, the folks at Britt put on dozens of live events, including a summer lineup with the Britt Orchestra and the popular annual Valentine Gala. As a result, thousands of couples make annual migrations to this gorgeous 2,200-seat music venue in the Pacific Northwest. Humans have been producing and connecting over music since prehistoric times. In fact, archaeologists have uncovered evidence of rudimentary flutes and other instruments scattered around human gathering places dating back to 50,000 BC. While the technology of how we play and listen to music has dramatically changed, people today still jump at the opportunity to come together and bond over the beautifully crafted sounds that move them. 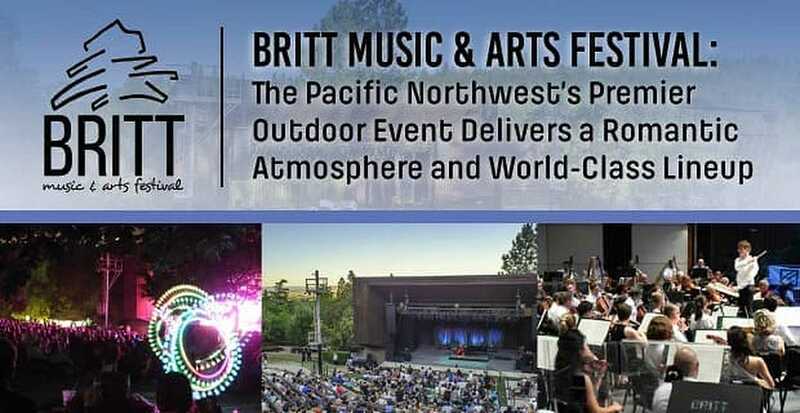 Approximately halfway between Portland, Oregon, and San Francisco is the Britt Music & Arts Festival, a cultural arts venue featuring outdoor stages, the Britt Pavilion, and Britt Performance Garden. Surrounded by madrone, sequoia, and ponderosa pines, Britt is more than just a great place to snuggle up with your date and catch a musical performance. As Mike Gantenbein, Britt’s Director of Marketing, told us, the festival is a way of life that connects visitors to humanity’s musical roots. Nestled on the beautiful hillside estate of 19th-century photographer Peter Britt, the live music venue was founded in the summer of 1963 when volunteers erected a makeshift stage of plywood and strung tin-can lights above it. A small chamber orchestra was assembled, and the rest, as they say, is history. The folks at the Britt Music & Arts Festival don’t do anything in a vacuum. In fact, it’s their hometown of Jacksonville, Oregon, and nearby towns of Medford and Ashland that spur this merry group of do-gooders to continue raising money for music education and to support local businesses. Mike told us Britt’s education department is highly involved in the local schools, bringing music programs and various concert series to students. “It’s our way of giving back to the community and saying thank you,” he said. Britt is also passionate about featuring local purveyors on-site for patrons to enjoy. Participating area restaurants include Fired Up Gourmet, Back Porch Bar & Grill, The Schoolhaus Brewhaus, and Peruvian Point. The festival also serves libations from nearby EdenVale Winery, Folin Cellars, Ledger David Cellars, Widmer Brothers Brewing, and 10 Barrel Brewing Co.
“Great company, great food, great music, and great drinks from our local wineries and breweries; you couldn’t ask for a better date spot in the Pacific Northwest,” Mike said. Whether you’re visiting the Britt Music & Arts Festival for a specific Britt Orchestra performance or have an entire week’s worth of the summer series’ classical shows on your itinerary, Jacksonville’s picturesque natural settings will create lasting memories. Check out nearby Oak Hill Bed & Breakfast in Ashland. Known for delicious full breakfasts and freshly baked treats, Oak Hill offers up comfortable accommodations set in quaint gardens and featuring gracious hosts that pay attention to every detail. The Britt Music & Arts Festival offers a world-class venue surrounded by awe-inspiring scenery. Another popular accommodation is Bybee’s Historic Inn, located just one mile from the Britt Gardens. An elegant 1857 classic revival Victorian bed and breakfast, Bybee’s is on 3 1/2 beautiful acres adorned with lush trees and flower gardens. If you’re looking to widen your perspective of Southern Oregon beyond eclectic live music, take a two-hour scenic drive to Crater Lake National Park in the Cascade Mountains. Formed by a collapsed volcano, Crater Lake is the deepest lake in the United States and features hiking trails, Ranger-led snowshoe hikes, and ski trails, among other activities. After a full day of hiking one of the nation’s most diverse and serene national parks, you and your date can enjoy some local cuisine at the dozens of different eateries in the area. Bella Union (or “The Bella” as locals call it) offers fresh seafood, homemade pastas, and decadent desserts. Check out Larks Restaurant in Ashland Springs. It has a menu chock-full of made-from-scratch comfort food. Once every 365 days, Britt Music & Arts Festival chooses the most romantic day of the year to host its Annual Valentine Gala to benefit the Britt Orchestra. The summer festival orchestra was founded in 1963 and features 90 professional musicians who come to the Rogue Valley from across the US for three weeks of world-class performances. Mike told us Britt usually pairs Teddy with vocalists, such as the renowned Morgan James and Britney Simpson. “The gala is a great affair to bring your significant other to,” he said. Under this acclaimed music director’s baton, each Britt Orchestra season consists of seven orchestral concerts, including a Symphony Pops performance and Britt Orchestra Spectacular. Additional festivities abound and include free BrittKids Koncerts and collaborations with a variety of community groups. Another philanthropic cause the folks at Britt Music & Arts Festival hold dear is Best of Britt, an annual benefit featuring music, food, wine, and auctions to benefit the organization’s education programs. Last year, Best of Britt welcomed Lyle Lovett and His Large Band, and Big Bad Voodoo Daddy has performed in previous years. From couples just getting to know each other to families who have been visiting Britt Music & Arts Festival for decades, Mike and his team have gotten to know quite a bit about their audience members.